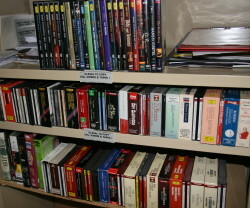 The Northside Opera Study Group has an extensive library of DVDs and CDs of operas, and some books. The library is constantly updated. New purchases include DVDs related to some of the lectures presented during the year and operas from the current season of Opera Australia and other opera groups such as Pinchgut and Pacific Opera. All members of NOSG are welcome to borrow these recordings and books from the library.